It rhymes what can I say. This is a review for a box of chocolates. Forest Gump said "life is like a box of chocolates..you never know what you're gonna get". I love that movie. When we were in Las Vegas there was an actual Bubba Gump store with all things Bubba and Forest in. I digress. A 1970's tin of Quality Street - Massive I might add not that we need super size but notice how the plastic 'tins' are reducing? Back to the chocolates. No ordinary 1970's chocolates. No sorry, they have come a long way haven't they?! 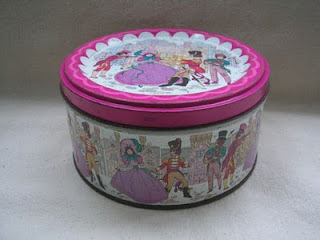 I, or rather my husband (I had two from this box) had the hassle (sigh hate blogging!) of having to eat these to review. My husband is partial to a bit of Art Deco and used to be an avid collector of Clarice Cliff pottery but then we had three children.....so he liked the box design. 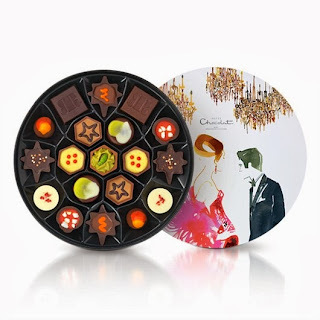 The chocolates look very appealing and whilst a bit pricey at £25 a box, they would make a wonderful gift. The flavours are original, decadent and are to be savoured. I don't know about you but when the quality of chocolate is more cocoa than sugar, I wouldn't be able to eat more than two in one sitting in any event. This is about quality over quantity. 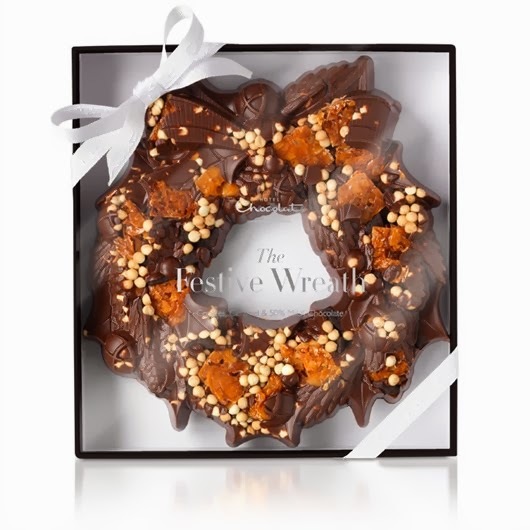 I was actually torn between this box to try and this lovely Christmas Wreath that features on their website Hotel Chocolat. And let us not forget the kiddiwinks -again, this would make a great stocking filler or a little gift to one of the kids friends and very reasonable at £7 or £6 for 3. 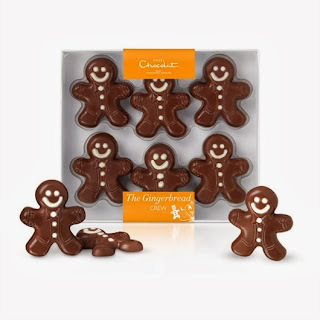 Love these gingerbread men - a steal and the parents will think ohhh Hotel Chocolat - quality! Check out their website and discover some original scrummy chocolate for all budgets. Hotel Chocolat gave me a box of chocolates for free in exchange for a review on my blog. The review is honest and I very much enjoyed the two I had (this is a diet blog after all) - the hubster gave the thumbs up to remaining chocolates.